Johann Muldoon MBE from County Derry/Londonderry has been recognised as the First Trust Bank Queen’s Graduate of the Year 2017 at this year’s ‘black tie’ Charter Day Dinner, held on Friday 24 November. The annual award is presented by the Queen's Graduates' Association (QGA), with the support of First Trust Bank to an ‘outstanding graduate, who has made a significant impact’ during the past 12 months. Making the announcement, Mark McKeown who is Manager, Regional Business Team at First Trust Bank said: “This year has been a phenomenal one for our Graduate of the Year. Recently, she made history by becoming the first local female in the architecture profession to be awarded an MBE for her contribution to architecture and business. Mark added: “First Trust Bank are proud to have been sponsoring the prestigious Student and Graduate of the Year awards at Queen’s University for almost 20 years. Johann has picked up several prestigious accolades in the last 12-18 months, including a Civic Award from Mid Ulster Council, and was a Forward Ladies STEM Rising Star Regional Winner and a finalist in a number of other national and international architecture competitions. While an undergraduate at Queen’s, Johann won the Andrew Forester Award for top student and the John Trewsdale Award for Building Technology, which previously had only ever been awarded at postgraduate level. She graduated in 1999 with a first class Bachelor of Science degree in Architecture. Joining Manor Architects in Moneymore in County Derry/Londonderry in 2008, Johann is now Managing Director and one of a small number of RIBA Specialist Conservation Architects in the UK. Throughout an illustrious career Johann has also been a champion for women in her profession, flagging up in a recent Belfast Telegraph interview that only 2 per cent of senior positions in architectural practices are held by women. A regular speaker at conferences and meetings, Johann is determined to use her platform to help women break through the glass ceiling, she has often been called on to offer young women advice in her quest for equality. Commenting on her latest award Johann said: “'There are certain places in life which we hold sacred. Queen’s University is, for me, one such place. Married to Gerard, Johann and her husband have three children – Conn (3), Erin (2) and Jack, who was born in mid November. QGA President Fergal McFerran, said: “The Graduate of the Year award recognises an exceptional graduate who has made a substantial contribution to their chosen field; and there is no doubt that Johann is an incredibly worthy recipient. “She is renowned as one of the world’s leading female architects and with a string of awards and prizes under her belt, it’s not hard to see why. Johann is a reflection of the exceptional quality of education provided by Queen’s University and is undoubtedly an inspiration to many of our current architecture students,” he added. 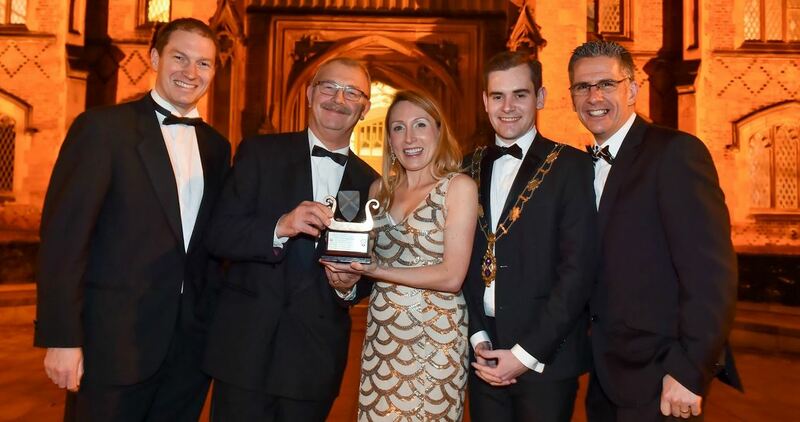 The Award, which has enjoyed the support of First Trust Bank for 18 years, was handed over by Queen’s Acting Vice-Chancellor, Professor James McElnay at the annual Charter Day Dinner and is the culmination of the QGA calendar. The presentation was followed by an one-to-one interview by the BBC’s Mark Simpson, also a Queen’s graduate, who spoke to Johann about her family background, her time at Queen's and her outstanding career. She told Mark how she overcame bullying and deafness at school, with the support of her parents. "Queen’s was the most privileged place to attend I can think of," said Johann. "I came through clearing and I only put Queen’s down on my form. Maybe that was foolish but I knew what I wanted. "People at the time said: 'What will you do if you are not good enough?’ Well, for someone like me that’s a red rag to a bull! So I worked hard, pulled a lot of all nighters…and was thrilled - I was jumping up and down on the spot - when I got a 1st class honours. "I am very, very stubborn, I want to instil in people that confidence has no competition. If you are confident in yourself, then no one can compete with you. "Being passionate means you will not stop whenever other people want to quit. But enough is never enough, so commitment matters," she added. Previous winners of the prestigious First Trust Bank Graduate of the Year Award include Jonny Bramley, BAFTA award-winning BBC Sport Executive producer, John Leckey, former Senior Coroner for Northern Ireland, the broadcaster and wildlife photographer Jonathan Scott and Ramona Nicholas, entrepreneur and former RTÉ Dragons’ Den panel member. The QGA Charter Day Dinner is kindly supported by First Trust Bank, Allstate and Woodford Bourne. Visit Queen's Graduates' Association for further information on the QGA or contact Queen’s Alumni Officer, Natasha Sharma, Development and Alumni Relations Office; tel: +44 (0)28 9097 3135. For media enquiries please contact Rachel McFarlane, QGA on 07739 960079. General inquiries to Gerry Power, Communications Officer, Development and Alumni Relations Office – tel: +44 (0)28 9097 5321.